I don't question an individual's experiences or their testimonies. If anything, I wonder why some are singled out. I've always believed that has more to do with being in touch with the spiritual world. It does seem some are more keenly aware. Regardless of the "caller", I do believe the message is the same: "Come to Me, all who are weary and heavy-laden, and I will give you rest." The revelations of war, disasters, famine, etc. are all forewarned in the book of Revelations for any to read, as you mentioned. However, those prophesies are not being taught from every pulpit. I guess they are considered too frightening. It is for that reason, that I believe others are still being chosen to spread the Word. After all, Mary, herself, was but a peasant chosen to be the mother of our Salvation, Jesus. Thank you for reviewing this book. You never know which testimony will make a difference to someone else. I also wish to comment about your own personal experience. Adults don't want to admit that a child would be chosen instead of one of them. There is a mix of envy, pride, and adult authority that prohibits most adults from acknowledging, or accepting, that a child was visited instead of them. A child is often chosen because their heart is not hardened to the messenger. It is very important for all of us to understand that the message IS the same just brought to us in different words. What speaks to one will not speak to another. Mary is saying the same things that her beautiful Son taught just in a different way. She even explains that John gave his prophecies using the language and knowledge of his own time which doesn't make them any less true...only a little harder for people to grasp in this time. As to those who are chosen for whatever purpose...Mary with a pure heart and an obedient soul was chosen to give human life to Jesus, Joseph was also chosen to help raise him. Neither would have been who the "world" would have picked. Jesus embraced the very people the the rest of the world scorned and brought them into His fold. His disciples were the most unlikely lot of people but He chose them. Why? There was something inside them that He knew was needed to fulfill the task. Thank you for this very interesting book review, Beverly. I would never discount a visitation to anyone, especially a child as children are so much more open and accepting when something unusual occurs. I am not particularly religious, but I do believe in spirituality and have always believed that our Native American population has had wisdom beyond any I will ever know. Ah Beverly, you have written such a wonderful review on a topic that means a great deal to me. 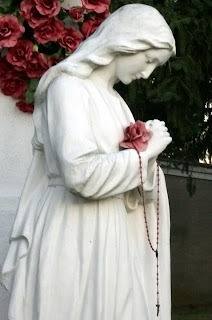 Like you I have a deep affection for Mother Mary. Oh to be so perfect in love as she was, that would be my ultimate goal. Children in their purity, are often the ones who receive these types of messages and I do believe you were one of the lucky ones. Mary holds a very special place in my heart and hopefully many will read this book and understand that truly loving people will bring you closer to God than any other form of prayer. Thank you! I'm Protestant, but I feel a connection to Mary because I also lost my son. I identify with her maternal heart and the pain she must have experienced as she watched her son be tortured and die. It's good she knew ahead of time from the angelic visitation she received before Jesus was born. As for a child receiving the message, Jesus himself accepted children in a way many of the adults in his lifetime did not. It's no wonder that Mary chose a child to visit. A beautiful message to read. No matter our beliefs, faith gets us there and love is the road home. I don't doubt your experience. Like you said, everything happens for a reason, and even if you never know what that reason is personally, it's helped someone along the way. I always believe that being open is the actual conduit.